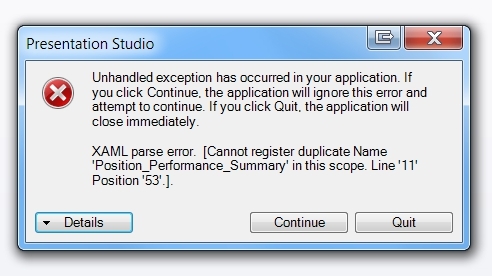 Unhandled Exception Error in PortfolioCenter Presentation Studio Let us manage the data, so you can manage the money. I received the above — rather intimidating — error message upon opening Presentation Studio in PortfolioCenter and attempting to edit a presentation. Clicking continue crashed PortfolioCenter. Clicking Quit closed Presentation Studio. I created a new Presentation and named it after the first report in it. I received no warnings or alarms at the time I created the new presentation. It wasn’t until the first time I attempted to use the Presentation that I discovered the problem. The only solution was to restore my latest backup and start over. Fortunately, I make daily backups this “nuclear option” created little distress. Moral: Be careful what you name new Presentations.